Senator John McCain, Capitol Hill’s chief Republican In Name Only, declared President Trump’s budget “dead on arrival” and his lackey in the House, Rep. Mike Simpson of Idaho predicted another continuing resolution for next fiscal year. The Trump administration budgetary requests are unlikely to be followed said Simpson. "This is [OMB Director Mick] Mulvaney's budget," Simpson said. "Like I want to go home after having [voted] against Meals on Wheels and say, 'Oh it's a bad program, keeping seniors alive.'" This is the kind of “Republican” policy that has federal spending on autopilot while tax collections are at record highs and the federal deficit is also at a record high. 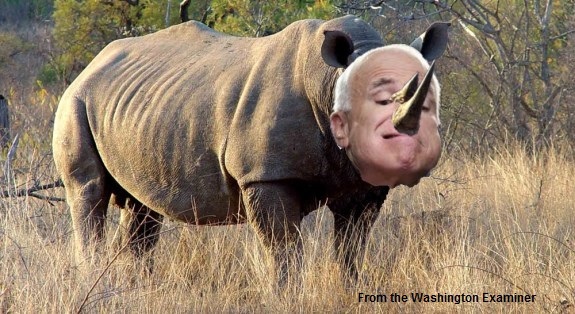 Conservatives, who may not agree with every detail of the President’s budget, should take a hard look at what McCain, Simpson and other RINO opponents of the budget are actually opposing. The Trump budget includes both discretionary and mandatory savings proposals that bring Federal spending under control and return the Federal budget to balance within 10 years. These proposals encompass a common-sense approach to redefine the proper role of the Federal Government, and curtail programs that fall short on results or provide little return to the American people. In total, the President’s budget proposal highlights 2018 savings of $57.3 billion in discretionary programs, including $26.7 billion in program eliminations and $30.6 billion in reductions. This is the first time in almost in a decade that a President has actually put forward a plan to bring spending under control. Here’s how the Trump budget does it. Repeal and Replace Obamacare. The Budget assumes deficit savings as part of the President’s commitment to rescue Americans from the failures of Obamacare, and to expand choice, increase access, and lower premiums in health care. Reform Medicaid. To realign financial incentives and provide stability to both Federal and State budgets, the Budget proposes to reform Medicaid by giving States the choice between a per capita cap and a block grant and by empowering States to innovate and prioritize Medicaid dollars to the most vulnerable populations. The Budget also follows through on a campaign promise and prohibits any funding in the Labor-HHS appropriations bill for certain entities that provide abortions, including Planned Parenthood. This prohibition applies to all funds in the bill, including Medicaid. Provide a Path Toward Welfare Reform. The Budget encourages able individuals to return to the workforce and includes a number of reforms to tighten welfare eligibility to those most in need. This includes SNAP reforms and proposals that strengthen child support and limit the Earned Income Tax Credit and the Child Tax Credit to those authorized to work in the United States. Reduce Improper Payments Throughout the Government. While the majority of Government payments are proper, any waste of taxpayer money is unacceptable. The Budget proposes to curtail Government-wide improper payments by half through actions to improve payment accuracy and tighten administrative controls. Redirect Foreign Aid Spending. The Budget supports the proper and appropriate activities of the Department of State and other international programs, while refocusing their work on the highest priorities and strategic objectives. It also proposes to reduce or end direct funding for international programs and organizations whose missions do not substantially advance United States foreign policy interests. Reduce Non-Defense Spending and Redefine the Proper Role of the Federal Government. In March, the President outlined a plan to reduce non-defense discretionary (NDD) spending by $54 billion in 2018, to offset increases in defense spending. To build on this approach and achieve a balanced budget by 2027, the Budget reduces NDD spending by two percent each year. Simplify the Tax Code and Provide Tax Relief. A comprehensive overhaul to our tax code will boost economic growth and investment. A simpler, fairer, and more efficient tax system is critical to growing the economy and creating jobs. Earlier this month, the Administration articulated several core principles that will guide its discussion with taxpayers, businesses, Members of Congress, and other stakeholders. The President is committed to working with these stakeholders to create a tax system that is fair, simple, and efficient – one that puts Americans back to work and puts taxpayers first. Reform Immigration Policy. The Budget supports commonsense immigration standards that protect American workers, and reduce burdens on taxpayers and public resources. When fully implemented, these changes have the potential to save American taxpayers trillions of dollars over future decades. Getting spending under control is among the many unfulfilled promises of the Republican establishment, and President Trump is correct to recognize that the first and most important impediment to making America great again is congressional spending. We urge CHQ readers and all our conservative friends to call their Representative and Senators, the Capitol Switchboard is 1-866-220-0044, tell them that you hold them responsible for the massive deficit the federal government has incurred while Republicans controlled Congress and you demand they join President Trump in balancing the budget. Submitted by tamforan on Wed, 05/24/2017 - 20:54. As to the Democrat charges that Trump's budget will cut the budgets of the programs for the poor and people will die; the existing budgets for most of these programs for the poor (Medicaid, food stamps, etc) are not being cut from the amount that they received in the 2016-2017 fiscal year. What is being cut in most cases, is the automatic increase they are due to receive for the coming fiscal year. Each and every year for the past 40 years or so, each of the government agencies has their yearly budget automatically increased by a certain percentage (baseline budgeting); whether they need the increase or not. Most of Trump’s budget cuts are just a cut in the automatic yearly increases in the budgets of these government agencies. He has proposed that a few programs be cut from government funding, but they usually have nothing to do with the safety net programs for the poor.